Download "Elegant Homes in West Toronto"
1 David Pylyp Elegant Homes in West Toronto Why Choose David Pylyp David Pylyp is a full time Realtor, committed to the task of providing dedicated real estate service to his clients through a detailed understanding of their needs. Clients know him to be a person of high integrity, focused on customer service and with a remarkable ability to listen, evaluate and execute. Humour and candor are key tools used to relay stories of other experiences and lessons learned. David Pylyp has had a long career in marketing fine real estate, nearly 19 years, and all with RE/MAX. Previous work experience was in marketing commercial loans for a large Trust Company. Combined this brings over 26 years of sales, business & marketing experience to you. The on-going RE/MAX Agent Training Programs and continuing education thru RECO approved courses in negotiation and technology give him the leading edge in state-of-the-art marketing and negotiating skills. These programs continually contribute and build his skills so that he can represent you better. When your home is listed through the Sherwoodtowne Branch of RE/MAX Realty Specialists Inc., which ranks #1 in units sold in Mississauga and Etobicoke, with 140 full time cooperating agents and with 460 FULL TIME agents company wide, you are assured of your listing getting attention. Our service desk is staffed by a minimum of 6 full time receptionists, 9 AM till 9 PM, that provide both , text & telephone appointment confirmations directly to you and to other BROKER S offices and never agents by cell phone. 2 My Elegant Homes Marketing Program builds on the fundamentals of Marketing but adds Internet Presence in addition to Print Advertising and brochures. PRESENTATION To Capture a Buyer's attention! 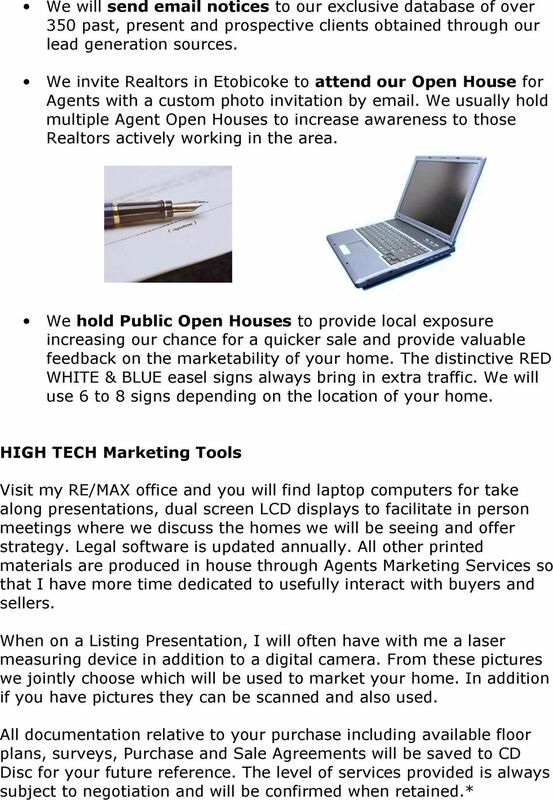 Your home must be properly prepared and well presented to sell quickly and for top dollar in today s competitive market. By using a Certified Redesign and Staging Specialist, we provide you with a Free Staging Consultation with Sandra MacLennan of House Dressing Redesign that will help to prepare your home, setting it apart from others in the marketplace. Well-staged homes are known to sell quicker and for higher prices. 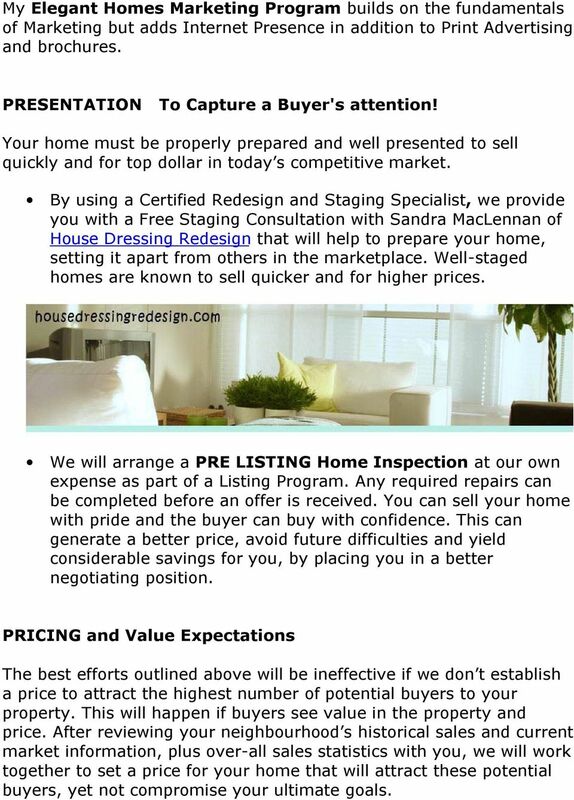 We will arrange a PRE LISTING Home Inspection at our own expense as part of a Listing Program. Any required repairs can be completed before an offer is received. You can sell your home with pride and the buyer can buy with confidence. This can generate a better price, avoid future difficulties and yield considerable savings for you, by placing you in a better negotiating position. PRICING and Value Expectations The best efforts outlined above will be ineffective if we don t establish a price to attract the highest number of potential buyers to your property. This will happen if buyers see value in the property and price. After reviewing your neighbourhood s historical sales and current market information, plus over-all sales statistics with you, we will work together to set a price for your home that will attract these potential buyers, yet not compromise your ultimate goals. 3 A Market Evaluation is personally prepared for you, with ALL the relevant details and variables explained. By having your home priced properly it will Generate Maximum Impact and qualified prospect s will see your home. Don t get fooled but Let s Try it Pricing or Testing the Market programs. Statistics show that a properly priced home will sell within 21 days. 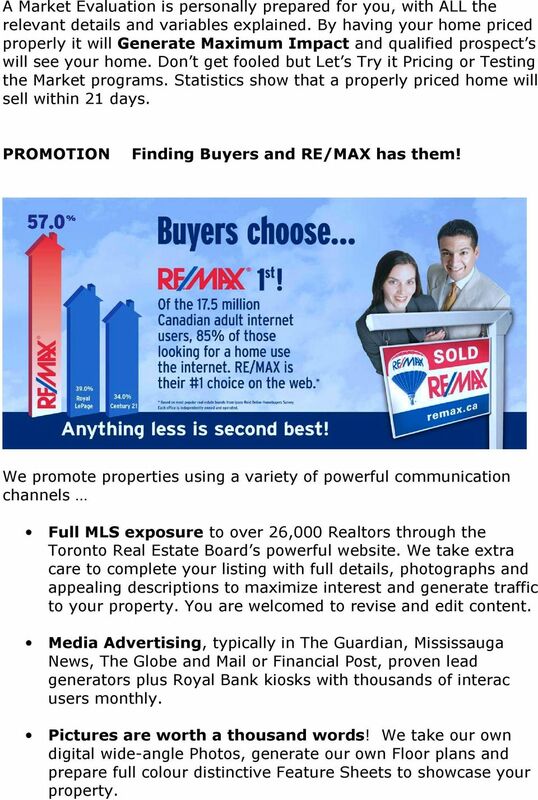 PROMOTION Finding Buyers and RE/MAX has them! We promote properties using a variety of powerful communication channels Full MLS exposure to over 26,000 Realtors through the Toronto Real Estate Board s powerful website. We take extra care to complete your listing with full details, photographs and appealing descriptions to maximize interest and generate traffic to your property. You are welcomed to revise and edit content. Media Advertising, typically in The Guardian, Mississauga News, The Globe and Mail or Financial Post, proven lead generators plus Royal Bank kiosks with thousands of interac users monthly. Pictures are worth a thousand words! We take our own digital wide-angle Photos, generate our own Floor plans and prepare full colour distinctive Feature Sheets to showcase your property. 4 Custom-built websites can be prepared by us to contain Floor Plans, many photographs and Virtual Tours. Learn more about our HIGH TECH Marketing Tools and see Sample Listings at By including Virtual Tours and digital photography we can create custom websites for your home and provide street signage with your web address! We often see HUNDREDS of hits a day on Elegant Homes in West Toronto. http// and have achieved a top 10 page ranking on Google for category of Homes in West Toronto & Realtor in West Toronto. My attractive Colour Flyers are available for both Agents previewing the property and as a Complete Take Away brochure for clients to mull over their purchase. Our site is linked to many other websites including the top two real estate websites in Canada & second only to MLS.ca in rankings for Real Estate enquiry visitor hits in Canada. Your agent and the Gilleran Griffin Company are ready, willing and able to sell your property. We will consider it our privilege to represent you. An Introduction Gilleran Griffin Realtors is pleased to have this opportunity to introduce the Gilleran Griffin Company and our agents. Together, we consider it a privilege to offer our services to you.